Pop shot this on one of his many lake freighter trips. 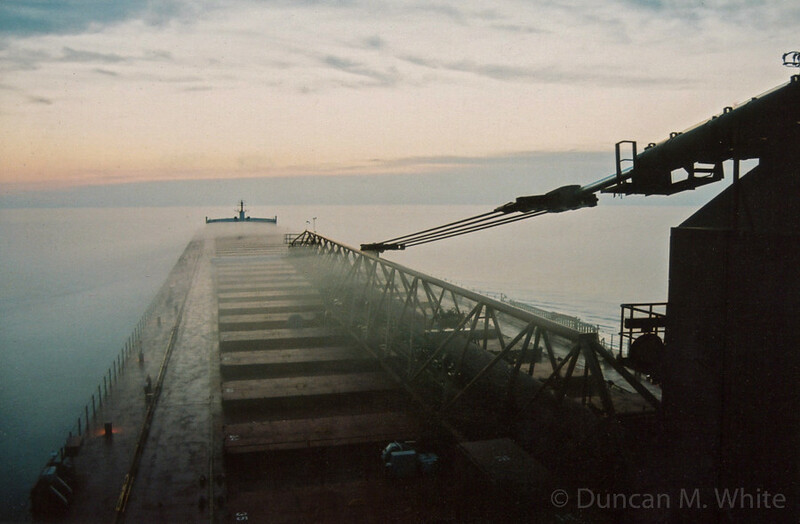 Taken from the port side of the bridge, you see the mist streaming through the self-unloader and across the hatches. This is not a pleasure cruise. This is a working boat that just happened to have one lucky photog on board. It could have been loaded with coal or stone or anything that needs to be somewhere else in large quantities. Broj and I thought this might be the M/V Paul R. Tregurtha and our friend Marc Dease suggested it could also have been the M/V James R. Barker. Lake boats are by definition big, most stretching between 600 and 700 feet, limited by the lock lengths of the Welland Canal. Laid up for the winter in the north slip at Sarnia, you used to be able to walk out on the ice in the winter right up to touch the hull. Thousand footers however are a class onto themselves. 1000+ feet long with a 105 foot beam, 50 feet deep. They can carry more than 60,000 tons. When they’re downbound from Lake Huron into the St.Clair river they glide by like silent giants with the current. Going upbound, you can hear the whop whop whop of the engines turning the screws. Do I miss the water, living here in WR? Yes, but the absence makes me more restless than wistful. And I channel that restlessness into doing something productive here. Invested. This entry was posted in photography and tagged 1shot, Duncan M. White, water. Bookmark the permalink.